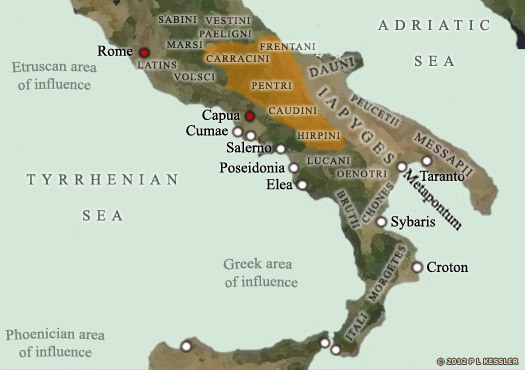 The Samnites were a group of Italics who, during the Iron Age, were located along the southern Apennines (see feature link, right), to the south-east of Latium. They were neighboured by the Marsi and Paeligni to the north, while to the east lay the Frentani and Dauni, to the south-east were the Iapyges, to the south were the Lucani and Oenotri, and to the west were the Opici, Etruscans, and Volsci. The Oscan-Umbrian group of which the Samnites were part are largely accepted as being Indo-Europeans (perhaps proto-Celts) who migrated into the peninsula from the north. 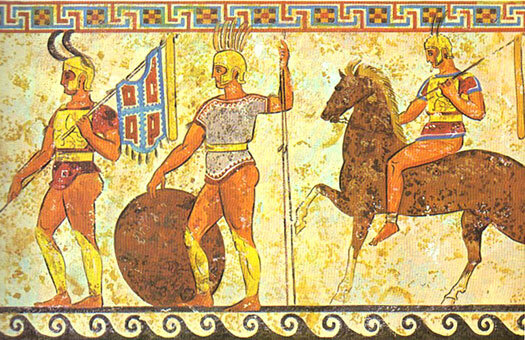 The Samnites were composed of four separate clans: the Carracini (or Carricini), Caudini, Hirpini, and Pentri (the most important of the clans), and were grouped together in a loosely-knit confederation. The Frentani were also originally Samnites, but were self-governing for much of their existence. Strabo and Pliny, along with other ancient writers, state that the Samnites were originally a tribe of the Sabellians. This was a collective of central Italian tribes during the Iron Age that also was comprised of the Marrucini, Marsi, Picentes, Sabini, and Vestini. More specifically, the Picentes and Samnites may have been a division of the Sabini. Writers frequently link one to the other, sometimes referring to the Samnites as Sabellus, seemingly as an umbrella term for their origin. From the Samnites were descended the Lucani, and from the Lucani the Brutii. Their language came from the Oscan-Umbrian group of Indo-European languages (P-Italic), which were widely spoken in Iron Age central and southern Italy before the rise to dominance of Latin (Latin itself was a slightly more distantly related language, coming from the Indo-European Latino-Faliscan group, or Q-Italic). The native name of this people was Safineis, with the region they inhabited being known as Safinium (or Safinim). The Romans interpreted this as Samnites while the Greeks called them Saunitai and their territory Saunitis. The tough Pentri tribe occupy the central Samnite region, between the Mainarde mountains to the north and to the Matese to the south. The most important of their settlements are Aesernia, Aufidena, Bovianum (the Samnite confederation's capital), Fagifulae, Saepinum, Terventum, and Venafrum. The Carracini tribe occupy the northern region, which is believed to be a less populated area. Their settlements include Cluviae and Juvanum. The Caudini are located to the south of the Pentri, amongst the mountains circumscribed by Campania's lowland. They are more exposed to Campania's Greek influence, with key settlements at Caiatia, Caudinium, Cubulteria, Telesia, Trebula, and Saticula. 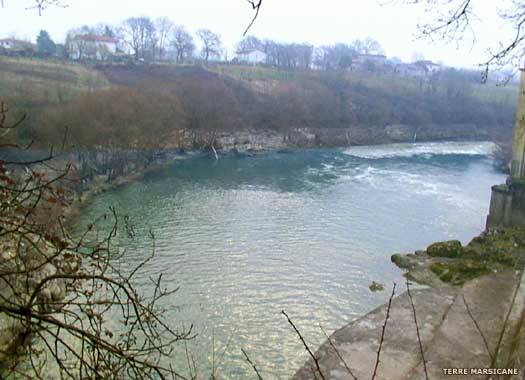 The Hirpini occupy the far south of 'Samnium', between the valleys of the Ofanto, Calore and Sabbato rivers. The Oenotri and Chones are pushed off the coast of the Gulf of Taranto by the founding of Greek colonies. They move inland, displacing the Lucani. Strabo later writes that the land named after the Lucani (Lucania) contained none of their number. Instead it is entirely possessed by the Chones and Oenotri. The Lucani are pushed northwards, buffering against their former Samnite cousins. The Marsi are subjects of the Samnites and remain so for the next two and-a-half centuries. By this stage, the Samnites themselves are undoubted masters of the central southern Apennines, probably having evicted or absorbed any remaining Opici. The Samnites agree a treaty with Rome, the first concrete historical record of their existence. It sets their border along the River Liris (now divided into the Liri and the Gari, with the one meeting the other shortly before the latter flows into the Tyrrhenian Sea at the Garigliano), and may in part be a joint defensive pact against Celtic incursions from the north. The Samnites are continuing to expand into former Etruscan Campania following their capture of Capua and Cuma. Their advances force the Greek city states along the coast to request of Rome that it reins in its ally. The Samnites also launch an apparently unprovoked attack against the Sidicini. When the Samnites refuse to listen to Roman 'reason', Rome triggers the First Samnite War. Roman Consul Cornelius attacks the Samnite town of Saticula (on the border of the modern region of Campania), but the war ends with Rome distracted by the Latin War against its other Italic allies. At the bargaining table, the Samnites agree to restore the former Roman-Samnite alliance on condition that the Samnites are permitted to go to war against the Sidicini if required. As Rome has no agreement with the Sidicini, the terms are accepted. The Latin War is the last major attempt by the Latins to retain independence from Rome. As its trigger, the Samnites attack the Sidicini who, in their desperation, offer to subjugate themselves to Rome. They are refused on the grounds that they are too late in seeking Rome's protection following the conclusion of the First Samnite War. 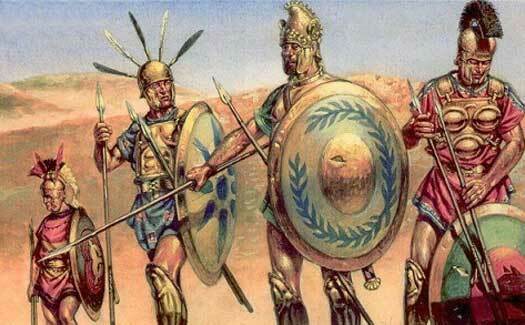 Instead, the beleaguered Sidicini ally themselves to a Latin League force which is advancing against the Samnites. Encouraged by Rome's indifference to the Latin-Samnite conflict, the Latins plan to attack Rome next. Rome hears of this and, following failed bargaining in the Senate with ten Latin chiefs to agree a new treaty, declares war against the Latin League. Allied to the Samnites, Rome fights for two years to defeat the Latins in a number of battles and subjugate them fully. The Latin League is dissolved, and some Latin states are annexed directly to Rome, while others retain autonomy. At around the same time as the former Peucetii settlement of Gravina is taken from Greek settlers by the Samnites, the Second Samnite War is triggered against Rome. During this period the Marsi ally themselves to the Romans in an attempt to remove the Samnite hold over them, while the Dauni, Iapyges, Lucani, Messapii, and Peucetii side with the Samnites. The Oenotri and Chones also appear to be subject to Samnite control by this time, during which the Samnite commander, Gaius Pontius, leads a force of around 9,000, including a thousand cavalry, with which he wins several early victories. He defeats the army of Roman Dictator Lucius Cornelius Lentulus, and captures the towns of Canusium and Gnaitha, but the Samnites suffer defeat at the hands of Quintus Fabius Maximus Rullianus at Imbrinium. Samnite meddix during the Second Samnite War. Executed. Meddix Gaius Pontius (a meddix being a consul or magistrate, and Pontius being the son of the philosopher, Herennius Pontius) commands the Samnite forces at the Battle of the Caudine Forks. Not actually a battle, the event (near Benevento) sees the Romans fooled into entering a trap in a mountainous defile, in which they are cornered by the Samnites. They are forced to agree terms so that they can return home and the terms of the agreement are maintained until 316 BC. The Frentani receive their first direct mention in history, at which time they are allied to the Samnites in the fight against Rome. However, they are quickly defeated and submit to Rome. Rome strikes back under Dictator Quintus Fabius Maximus Rullianus when he successfully besieges Saticula. He is less successful when he fights the Samnites at the Battle of Lautulae, during which his inexperienced levies are no match for seasoned Samnite warriors. The southern reaches of Latium are captured and the second class Roman citizens there are persuaded to abandon their allegiance to Rome. The Samnites advance on Rome itself and, although it is successfully defended, the Samnites storm through the weakened Roman lines of the Liris Valley and capture Sora. The lines of communication to Apulia are cut and the Samnites enjoy the high watermark of their superiority. The Romans have been learning from Samnite fighting methods and begin to turn the tables. Gaius Pontius is captured and executed by Roman Dictator Quintus Fabius Maximus Rullianus, probably during the latter's third and last dictatorship. Etruscans allied to the Samnites fight Rome at the Battle of Sutrium (modern Sutri). The Roman forces are commanded by the now-Consul Quintus Fabius Maximus Rullianus. After winning the battle on this key route into Etruscan territory, he pursues the Etruscans into the ancient Ciminian Forest, which divides Latium from Etruria, where he defeats them again. Probably seeing the error of their earlier decision, the Marsi revolt against Roman control and return to the Samnites for the remainder of the Second Samnite War. The Samnites are defeated by Rome following their loss at the Battle of Bovianum. Their confederates, the Frentani, Marsi, Marrucini, and Paeligni, voluntarily accept their reintegration into Roman administrative rule. All the other Samnite allies are also subjugated by Rome, as are the Opici, who apparently inhabit the territory between the two main protagonists in the war. Rome concludes a treaty with the Picentes, or what Livy later terms the Picentine people. About two years later (still in 298 BC) the Picentes warn the Roman senate that they have been approached by the Samnites, who are seeking allies in advance of a renewal of hostilities against Rome. The Third Samnite War begins with Consul Quintus Fabius Maximus Rullianus immediately defeating the Samnites at Tifernum after managing to encircle their forces. Samnite leader during the Third Samnite War. Killed. Gellius Egnatius marches into Etruria in 297 BC to rouse the Etruscans and form a coalition against Rome. The combined armies of consuls Lucius Volumnius Flamma Violens and Appius Claudius Caecus defeat this force and the Samnites withdraw back into their own territory. In 295 BC, Quintus Fabius Maximus Rullianus, Roman consul for a fifth time, wins lasting fame after he defeats a fresh coalition of Gauls and Samnites at the Battle of Sentinum (near the modern town of Sassoferrato). Egnatius is killed. The Samnites are defeated by Rome at the Battle of Aquilona in 293 BC. The nearby capital of the Samnite confederation, Aquilona (in modern Campania), is destroyed. The former Pentri capital of Bovianum resumes the role, although the Samnites are gradually broken, accepting final defeat in 290 BC. The Samnites (including the Frentani and Hirpini) under Numerius stand with their Lucani and Brutii allies against a Rome that is now determined to break their obstinate enemy once and for all. Consul Lucius Cornelius Scipio raises fresh legions with the senate's approval to march against Bovianum. The Roman legions outnumber the Samnite force, and Numerius' allies fail to arrive in time to prevent a final, crushing defeat. The Samnites, Lucani and Brutii are subjugated, although the Samnites continue to pose a threat in more isolated pockets for some time to come. Along with the Etruscans, Frentani, Hirpini, Iapyges, Lucani, Marrucini, Marsi, Paeligni, Picentes, and Vestini, the Samnites fight the Social War (Italian War, or Marsic War) against Rome. The war is the result of increasing inequality in Roman land ownership, and the spark for conflict is delivered by the assassination of the reforming Marcus Livius Drusus, whose efforts would have led to citizenship for all of Rome's allies. The Samnite noble, Gaius Papius Mutilus, leads the southern rebels, winning a notable victory at the town of Nola. The town is captured and 2,000 Roman soldiers are starved to death when they refuse to surrender. Papius progresses to capture the towns of Stabiae, Minervium, and then Salernum. He collects fresh units from the conquered areas, swelling his army to 10,000 men and a thousand cavalry. Only his second defeat is to Sulla, which effectively ends his war. He is granted citizenship, but later commits suicide. Commander of the Samnites under Papius. Commander of the Pompeiani (formerly a Samnite city). Killed. Commander of the Samnites. Killed in action. With most of the Italics defeated, only the Samnites stand against Rome, so the latter agrees concessions to end what may be a prolonged conflict. The Italic tribes are granted the Roman citizenship which had previously been withheld from them. Roman Dictator Lucius Cornelius Sulla conducts an ethnic cleansing campaign against this most stubborn and persistent of Rome's adversaries and forces the remnant to disperse. So great is the destruction delivered upon them that it is recorded that 'the towns of Samnium have become villages, and most have vanished altogether'. The remnants of the Samnites are quickly absorbed into Roman Italy and disappear as a recognisably distinct people.